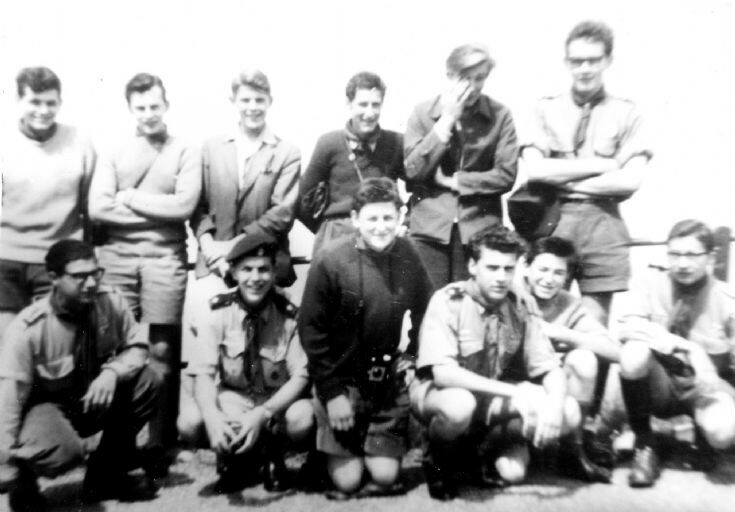 Further to picture #2402 the photograph shows some of the Handcross Scouts with three of their hosts in Zurich. Back row: 1 Barry Ray, 2 Chris Johnson, 3 Raymond Trickey, 4 Godfrey Parker, 5 Mick Pateman. Front row: 2 Tom Chamberlain, 3 Ron Verlander, 4 Norman Leppard, 5 Rodney Pattison. Click on Open Document to view a newspaper cutting of the tour. It was probably in about 1962 that some of the Scouts who had been our hosts in Zurich came to visit us, travelling in a VW Crew Bus adorned with a scout motif on the front. They brought some Swiss cheese with them so that they could treat us to a traditional Swiss fondue but unfortunately it was lost in transit. In desperation, we called out Sid Sargent to open up Wards Stores out of hours, but he could not locate enough suitable Gruyère or Emmenthale in the shop. Thus, we missed out on the fondue! The Large Version shows the Swiss party with some of their Handcross hosts. The Handcross scouts were: 1 Barry Ray, 2 Mick Pateman, 4 Tom Chamberlain.